"A zesty summer salad to serve as a cool summer supper, potluck contribution, or even a ladies luncheon. A good way to use up leftover chicken and rice. If leftover chicken and rice are not available, boneless chicken breast and regular or instant rice can be prepared ahead of time." Mix chicken and lemon juice in a large mixing bowl. 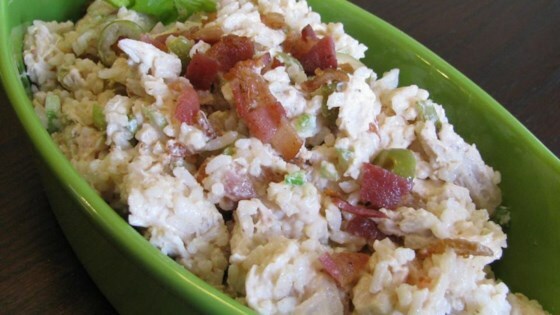 Mix rice celery, olives, and 1/4 cup bacon in a separate bowl; add to chicken and toss to combine. Whisk mayonnaise, barbeque sauce, and liquid smoke together in a small bowl; pour over the chicken mixture and toss to coat. Top with remaining 2 tablespoons bacon. Cover bowl with plastic wrap and refrigerate 2 hours to overnight.